This apple cider vinaigrette, made with apple juice, vinegar, olive oil, salt, and pepper, creates a quick, easy, slightly sweet, subtly tangy, apple-y salad dressing that’s far more handy and versatile than you can even imagine. 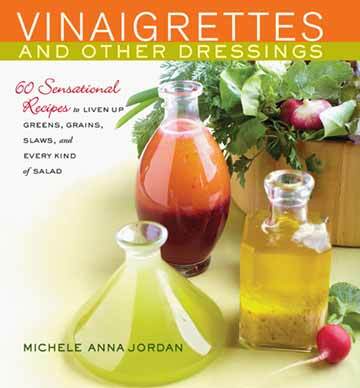 Apple Cider Vinaigrette Recipe © 2013 Michele Anna Jordan. Photo © 2013 Kimberley Hasselbrink. All rights reserved. All recipes and photos used with permission of the publisher. If there is but one simple vinaigrette in your repertoire, this apple cider vinaigrette has to be it. Easy, delicious, spicy, saucy, spirited, and just plain glorious. Great on tomatoes, lettuce, and cream cheese with some chopped basil for a nice spread for crackers (I just made that up in my head and tried it—it’s really, really good). In fact, this is one of those recipes that you can use as your master list of ingredients and proportions and then just get crazy with things you can add to it or pour it on. Simple, tasty, and classic are the words that come to mind to describe this wonderful apple cider vinaigrette that’s so easy to put together. Everyone loved it, including the one person in the house who refuses to eat vinaigrettes—high praise, indeed, for a simple recipe. I used a lidded jar to make it and I just shake it before each use. We were able to lightly dress a watermelon, cucumber, and feta salad for dinner and a mixed greens salad for lunch the next day with the same dressing made in just one batch. This recipe is simple enough you could dress it up in many ways with different herbs. This apple cider vinaigrette is a very easy recipe and takes only a minute or so to whip together. But don’t be fooled. It’s excellent. I used fresh apple juice (I had some in the fridge ), apple cider vinegar from Trader Joe’s (I always have that in the cupboard ),and a very mild olive oil. The salad I made was simple, just some thinly sliced apples, bibb lettuce, and celery leaves topped with some toasted walnuts and pomegranate seeds. This vinaigrette complemented the salad very well. I will make it again. I liked the fact that I made this apple cider vinaigrette in fewer then 5 minutes. It was very easy to make and emulsified very well. My husband and I both thought it was very good. I used artisan apple cider from a local orchard instead of apple juice. I used a high-quality olive oil and will use less oil next time because I thought the olive oil took over some of the apple vinaigrette flavor. I also added one more tablespoon each cider and vinegar. The vinaigrette went quite well with a simple mix of tossed spring lettuces served with a grilled pork chop. I also brushed the vinaigrette on the pork chops while I was grilling them. My husband chose to make a sandwich with the salad and chops with some grilled onions and he loved it. This apple cider vinaigrette recipe is simple, tasty, and satisfying. We will make this again. We whipped up the basic version of this vinaigrette to drizzle on a lunch of quinoa, orange, apple, and shredded Brussels sprouts. We would have added toasted hazelnuts if we had them on hand. 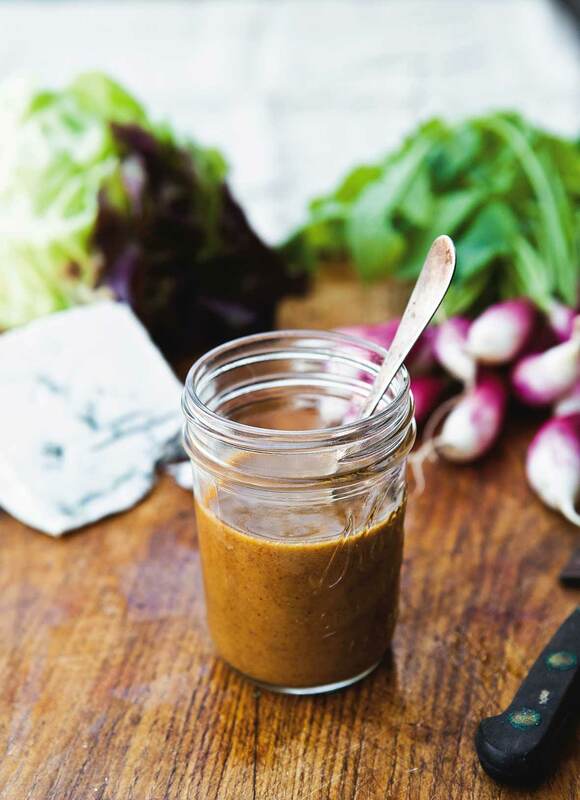 This apple cider vinaigrette is one of the simplest vinaigrettes to make and it's absolutely delicious. I used fresh apple cider in my vinaigrette, which gave it a crisp, light taste. It was fantastic on salad, and I even “accidentally” got some on my pork chops and the vinaigrette lifted the taste of the pork. It's the perfect autumn salad dressing. This apple cider vinaigrette was a lovely, fruity alternative to the basic balsamic vinaigrette that I habitually prepare. I tossed it with a wonderful fall salad made from apples, toasted pecans, and sharp Cheddar cheese and it was fabulous! I used apple cider in lieu of apple juice to create a more full-bodied flavor and it really brought out the essence of the apple. It was effortless to make and I undoubtedly will make it again. I will, however, modify the recipe slightly the next time that I prepare it. I think an extra tablespoon apple cider would further impart the flavor of apple. Another method that I’ve used in the past is to start with 1 cup apple juice and boil/reduce the mixture to approximately 3 tablespoons to create a wonderfully robust apple flavor. I would also lessen the amount of olive oil, perhaps to 3 to 4 tablespoons, depending on how tangy you like your vinaigrette. So much from so few ingredients! I love apple cider vinegar and apple cider, so this looked like a winning combination. I had some cabbage and some apples from our tree, so I planned to make a slaw. This recipe came along at just the right time. I used an organic, unfiltered cider vinegar, but the jewel in the crown is the fresh pressed apple cider from the orchard just 5 minutes from my house. This cider has the richest, deepest flavor of any cider I've ever tasted. I had some olive oil from a small operation in Napa Valley, California, but it's so full-bodied I used only 2 tablespoons of it and then I used a lighter olive oil for the remaining 4 tablespoons as I didn't want to run the risk of the oil overpowering the apple cider. I don't know if I would try this with just apple juice, I think it needs the robust flavor of the cider. Since I was trying this with a slaw for the first time, I was generous with the pepper, but I didn't overdo it. Again, I didn't want to take away from the apple cider. The apple and cabbage slaw was wonderful with some grilled pork chops. I also used the vinaigrette on a tossed green salad and on some roasted butternut squash instead of butter or sour cream. This is a new addition that's going to be very popular in my house. Just shows that sometimes simple can be better. I never purchase store-bought salad dressings, so I’m always looking for interesting new dressings. I made the apple cider vinaigrette with apple juice since cider is not available where I live, though interestingly enough apple cider vinegar is available. I made it exactly according to the recipe and thought it was very good. Then I added an additional 2 tablespoons olive oil and 3 minced garlic cloves garlic to it which, in my opinion, made it even better. I had some blue cheese in my fridge so I made it again, adding the cheese and processing it in my food processor. The first dressing had a nice bite to it and will be a nice addition to my repertoire of salad dressings. The addition of the bleu cheese took it to another level. I served it over a simple green salad and everyone loved it. I always make my own vinaigrettes (a nice Dijon vinaigrette is my favorite) and love trying new variations, so this apple cider vinaigrette was right up my alley. It’s a wonderfully tasty and simple dressing for fall. I used apple cider instead of apple juice for a deeper apple flavor and served it over a salad of butter lettuce, red onion, and blue cheese. I think some chopped apples and walnuts or pecans would also be a nice addition. I served this lovely salad and vinaigrette alongside grilled pork chops and it was a wonderful complement to the overall meal! This apple cider vinaigrette was so good that I searched for things to use it on! I typically use a Mason jar to make my vinaigrette in, so I added all the ingredients to a small jar, shook it up a bit, dipped a small spoon in to taste, and declared it a success! It’s so quick to make, but what it will do for a salad or meat is really amazing. The first night I made it I used it as a sauce for some boneless, skinless chicken thighs. I of course used it to dress several salads throughout the week. Very yummy! I can totally see how this would pair well with pork! In fact, it would make for a really unique and interesting glaze for ham. Perhaps a shift from the traditional ham glaze will be happening in my house this Thanksgiving! This apple cider vinaigrette is a keeper, especially for the fall months. The recipe is a lesson in combining a few simple ingredients to make something that is more than its parts. I had fresh-from-the-orchard, unfiltered apple cider and it made the recipe. The dressing brightened up my ordinary tossed salad, elevating my ho-hum weeknight lettuce, carrots, and celery to new culinary heights. Next time I’ll use the vinaigrette on a more autumnal salad made with fresh apple, slivers of Parmesan, and dried cranberries. I also might make a warm bacon dressing with this recipe by relying on bacon fat instead of olive oil. Oh, the possibilities! I used half the amount of salt and thought it was plenty salty enough, but I am somewhat of a light salter. I also used half the olive oil and it was plenty—more oil would have made it too oily and overpowered the delicate cider flavor, but I usually make my vinaigrettes with much less oil than called for. This recipe was a breeze to make on a weeknight. I used apple cider and organic, unfiltered, apple cider vinegar. I combined all the ingredients (minus the olive oil) in a small jar, shook it up, added the oil, and then shook it up some more. It was done in less than 5 minutes. I threw together a quick salad of toasted, chopped walnuts, gorgonzola, and a mix of baby lettuces and then dressed it with some of the vinaigrette. I have to start my review with a note about the ingredients. I'm fortunate to have apple orchards nearby, so for this vinaigrette I used a good cider and an absolutely amazing cider vinegar, which is made at a nearby orchard. This is a cider vinegar very far removed from what is sold in the supermarket, so good you can just drink it straight. So given those ingredients, this made a very pleasant vinaigrette. I used it to dress a salad of spinach, toasted walnuts, roquefort, and thinly sliced apples from the same orchard as the vinegar. I don't even like salads very much, but this was stunning. Next time, I might reduce the olive oil just a bit to keep the flavors a little brighter and because my vinegar was quite mild. If you have access to a local artisanal cider vinegar and good local cider, this vinaigrette is the perfect thing to dress your fall salads. As with any recipe this simple, good ingredients will be the key. A nice and easy apple cider vinaigrette recipe that captures the essence of fall. No frills or fancy—just a tasty vinaigrette! Nothing to tweak, except add some bacon to your salad! I think this would be great drizzled all over a bacon, apple, and cheese salad! I LOVE the idea of 50/50 cider & vinegar – our local orchard makes their own vinegar & I can’t wait to make this w/ it! And we can’t wait to hear what you think of it, Fran! Thank you so much for featuring a recipe from this book! I particularly enjoy all the comments by the testers. I wanted to let you know that the book’s web site, postponed because of the sad passing of my designer, has now launched. Once again, thank you. This is a great site. michele, our pleasure. I’s a lovely recipe. And we’re glad to know your site has now launched. I was driving and heard a chef recommend using an apple cider vinaigrette with chopped celery and a chopped apple. It sounded intriguing but I couldn’t write down the recipe (which she gave quickly) while driving so went on the internet and found this. Just tried it with the chopped celery and chopped apple and it was great! Modifications: I did add an extra tablespoon of the apple cider and I tried adding chopped red pepper in the salad (for color). It was great and now I will share this with others! Also – when I read the comment about adding pomegranate, I thought that sounded even better so will try it tomorrow. I’ll be taking this salad to a Thanksgiving gathering so thanks for sharing this tasty – and oh, so easy – recipe! Linda, agreed. This is a simple a delicious recipe. And it’s one of the most popular on our site, too. Happy Thanksgiving!